Habit: Perennial herb from rhizome. Stem: annual to perennial herb, generally erect, of 2 kinds (sterile, fertile) or not; internodes with lengthwise alternating ridges and grooves, hollow except at nodes, branches 0 or whorled, alternate leaves. Leaf: scale-like, whorled, fused into nodal sheath with as many teeth as leaves, generally not green. Sporangia: several on inner surface of peltate scales that are clustered into a terminal cone; spores of 1 kind, spheric, green, unmarked, with 4 strap-like appendages. Genera In Family: 1 genus, 15 species: worldwide except Australia, New Zealand. Stem: perennial herb, of 1 kind, 60--210 cm, green, scabrous; sheath 7--17 mm, +- as long as wide, generally with 2 dark bands, 1 at base, 1 at tip, teeth 22--50, generally deciduous; branches 0. Sporangia: cone tip pointed; spores green, spheric. Ecology: Streams, moist, sandy, gravelly areas; Elevation: < 2500 m. Bioregional Distribution: NCo, KR, NCoRH, NCoRO, CaR, SN (exc Teh), GV, CW (exc SCoRI), SW (exc s ChI), Wrn, SNE, D; Distribution Outside California: North America, Mexico, Guatemala. Note: 1 other subsp., in Europe, Asia. 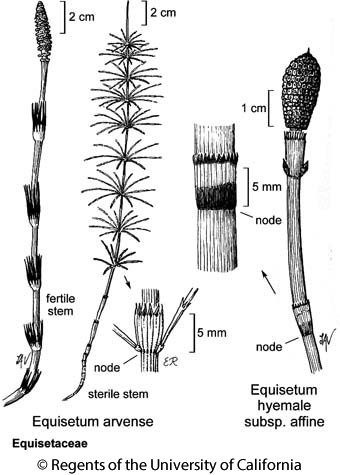 Citation for this treatment: Robert E. Preston & Richard L. Hauke 2012, Equisetum hyemale subsp. affine, in Jepson Flora Project (eds.) Jepson eFlora, http://ucjeps.berkeley.edu/eflora/eflora_display.php?tid=50315, accessed on April 19, 2019. NCo, KR, NCoRH, NCoRO, CaR, SN (exc Teh), GV, CW (exc SCoRI), SW (exc s ChI), Wrn, SNE, D; Markers link to CCH specimen records. Yellow markers indicate records that may provide evidence for eFlora range revision or may have georeferencing or identification issues. Purple markers indicate specimens collected from a garden, greenhouse, or other non-wild location.